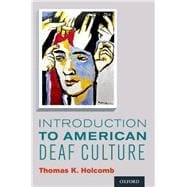 Introduction to American Deaf Culture is the only comprehensive textbook that provides a broad, yet in-depth, exploration of how Deaf people are best understood from a cultural perspective, with coverage of topics such as how culture is defined, how the concept of culture can be applied to the Deaf experience, and how Deaf culture has evolved over the years. Among the issues included are an analysis of various segments of the Deaf community, Deaf cultural norms, the tension between the Deaf and disabled communities, Deaf art and literature (both written English and ASL forms), the solutions being offered by the Deaf community for effective living as Deaf individuals, and an analysis of the universality of the Deaf experience, including the enculturation process that many Deaf people undergo as they develop healthy identities. As a member of a multigenerational Deaf family with a lifetime of experience living bi-culturally among Deaf and hearing people, author Thomas K. Holcomb enhances the text with engaging stories interwoven throughout. In addition to being used in college-level courses, this book can also help parents and educators of Deaf children understand the world of Deaf culture. It offers a beautiful introduction to the ways Deaf people effectively manage their lives in a world full of people who can hear. Who are the Deaf People?